Are you facing the challenges of becoming a global organization? Reducing cost and cycle time?Managing the use of more part-time, temporary, and contract workers? Does improvement in the value of your organization’s stock, operating income; sales, return on sales, employment and asset growth interest you? 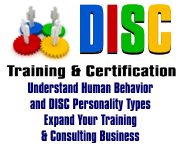 I have worked with hundreds of businesses and find all business owners and executives want to create excellent organizations, but many are unsure how to do it. What is needed is ONE business improvement model that helps improve performance in EVERY aspect of the organization–unifying strategy from top to bottom. The good news is there is an excellent process available and even better–it is free of charge. 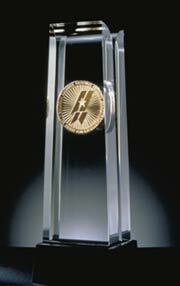 The name of the process is the Malcolm Baldrige National Quality Award. 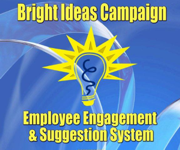 Consider Branch-Smith Printing, a Malcolm Baldrige Award winner. Branch-Smith is a small 70-person, family-owned business in the Dallas-Ft. Worth area. They began using the Baldrige process in the 90’s and transformed their business from a typical, family-owned style of management into a professionally managed organization generating excellent results that speak for themselves. From 1998 to 2001 they increased the number of customers from 91 to 167. From 1997 to 2001 they tripled their market share and during the same period increased sales by 72%. This is remarkable when other printing companies experienced decreasing sales during the same period. Branch-Smith is only one of thousands of U.S. organizations finding the Criteria to be a significant tool for improving performance on the critical factors that drive overall success. Business, education, and health care organizations can all benefit from using the performance criteria provided in the Baldrige application process. Does the Baldrige process generate results or just another fad? A comparison of Baldrige Award recipients to the Standard & Poor’s 500 (S&P 500) shows that the 24 publicly-traded, 1988-1998 Baldrige Award recipients, as a group, outperformed the S&P 500 by approximately 3.8 to 1.The six publicly-traded, whole company Award recipients, as a group, outperformed the S&P 500 by approximately 4.8 to 1. 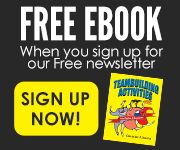 You do not have to win the award to benefit from the Malcolm Baldrige process. Working through the criteria and submitting an application offers valuable benefits. The feedback report that every applicant receives contains both strengths and opportunities for improvement – important inputs that can help your organization improve. Awards may be given annually in each of five categories: Manufacturing, Service, Small Business, Education, and Health Care. Since 1988, 49 organizations have received the Baldrige Award, including Motorola, Inc., Ritz-Carlton Hotels, Wainwright Manufacturing, FedEx, and SSM Health Care. 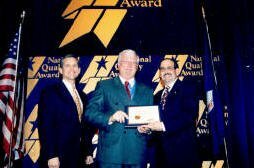 Sixty-eight organizations have sent NIST their application for the 2003 Malcolm Baldrige National Quality Award, the nation’s Presidential award for excellence. Last year, 49 businesses, schools, and health care organizations applied. Over the next six months, teams of specially trained examiners will evaluate these 68 organizations to determine which will receive the Award this fall by President Bush. The 68 applicants for the 2003 Malcolm Baldrige National Quality award include 10 large manufacturers, eight service companies, 12 small businesses, 19 education organizations and 19 health care organizations. This is an increase in all categories compared with the previous year. The application process for the Baldrige Award is rigorous and thorough. Applicants for the award submit up to 50 pages of details showing processes, improvements, and results in seven areas, including leadership, customers and markets, human resources and strategic planning. Information about the Baldrige National Quality Program and the application process is available free of charge from the Baldrige National Quality Program website.